1.apple of division, 2002 digital illustration print on canvas 16x20 cm., US$ 1,000.00. 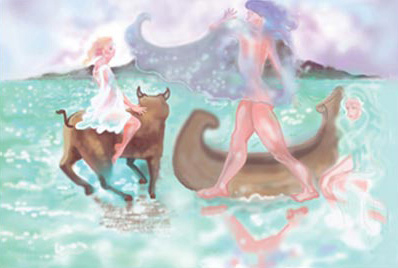 2.Europa and Poseidon, 2002 Digital Painting / Print on Canvas 30x20 in. | 76,2x50,8 cm., US$ 1,200.00. 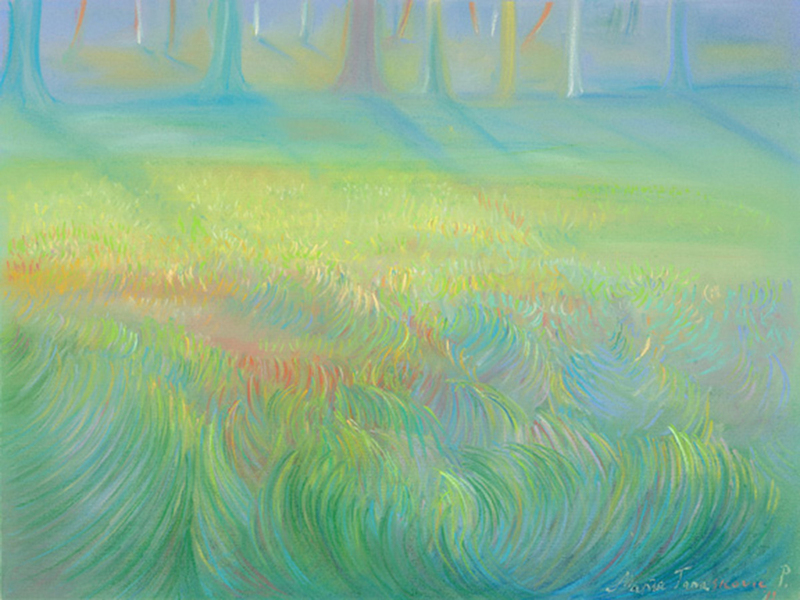 3.searching for the source, 2002 dry pastel and print on mental 40x30 in. | 101,6x76,2 cm., US$ 2,000.00. 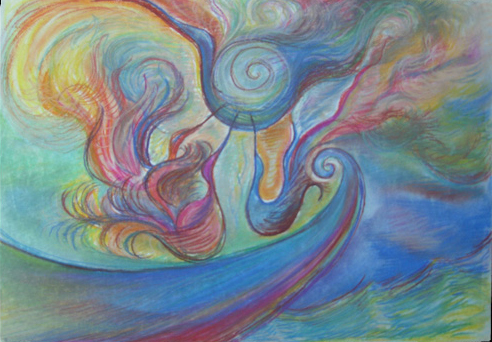 4.peace beam, 2012 dry pastel and print on mental 40x30 in. | 101,6x76,2 cm., US$ 2,000.00. 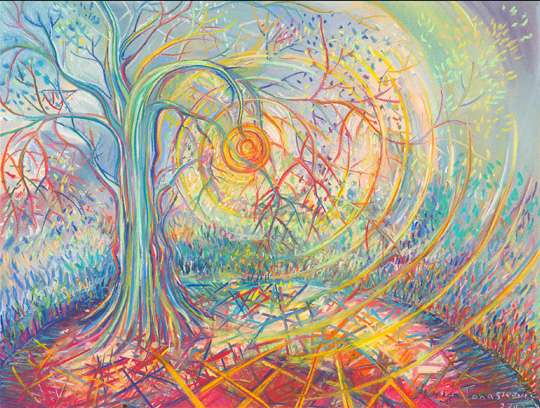 5.haven's gate, 2012 dry pastel and print on mental 40x30 in. | 101,6x76,2 cm., US$ 2,000.00. 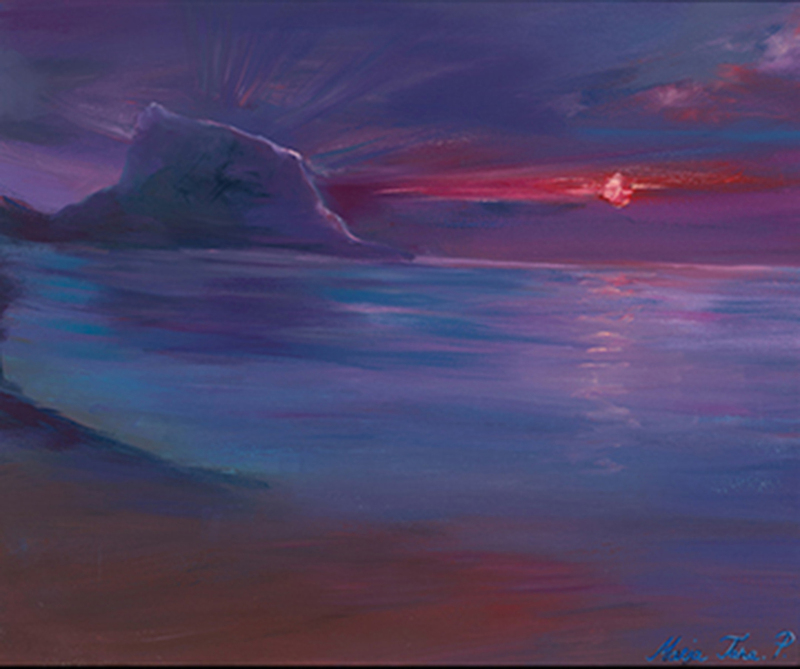 6.Sunset Rhapsody in Violet, 2004 oil on canvas / Print On canvas 40x30 in. | 101,6x76,2 cm., US$ 2,000.00. 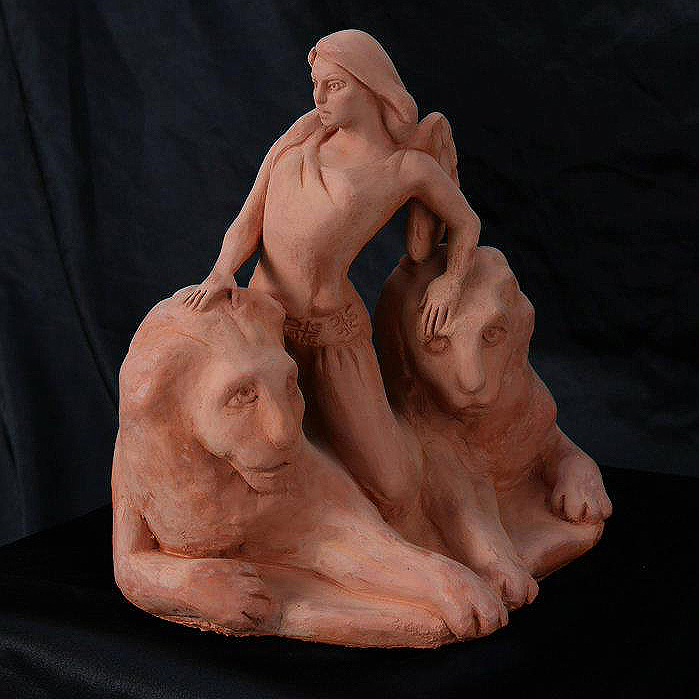 7.serbona, 2011 Terracotta 4,3x5x6,3 in. | 20x22x20 cm., US$ 65,000.00. 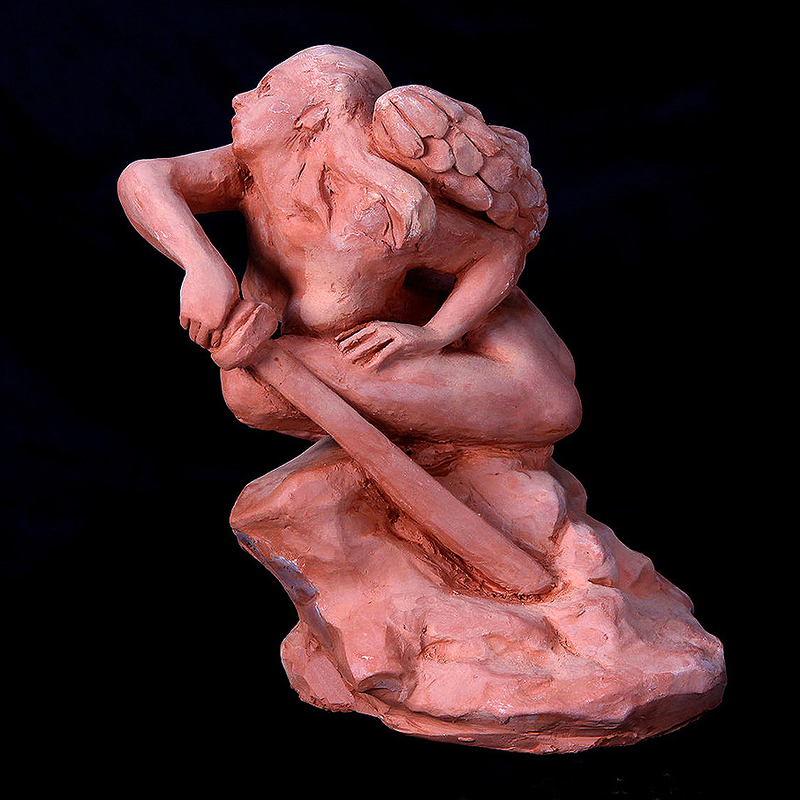 8.slava, 2011 Terracotta 8x9x8 in. | 20x22x20 cm., US$ 40,000.00. 9.The Soul of the bird, 2009 dry pastel (charcoal) print on mental 40x30 in. | 101,6x76,2 cm., US$ 2,000.00. 10.Phoenix, 2002 dry pastel and print on mental 40x30 in. | 101,6x76,2 cm., US$ 2,000.00. 11.Thinking of Her Self painting, 2015 oil on canvas /Print On canvas 4x2,5 in. | 121,92x76,2 cm., US$1,700.00. 12.Me That Wolf, 2015 oil on canvas / Print On canvas 4x2,5 FT. | 121,92x76,2 cm., US$ 1,700.00. As a matter of fact, the strongest impressions usually cannot be described by words, but by the nonverbal communication, where the visual arts belongs at the first place. I came up with the conclusion that the Great Works of Art, did not make people only spiritually enriched, but they are the major contributors to our civilization. Great works of Art are reflecting not only our impressions about them, but the deepest wishes, which are following every human being. Changing the mood in the observer and trying to shift his thought process, to make him think positive by exposing that person to my creations, is only one of many things I am trying to achieve. I am looking for the psychological influence of the visual adds that are carrying the aesthetic value, because they are presenting the example of the visual harmony (Beauty). However, my goal is actually to show that the achieved visual harmony has a code that an educated observer needs to follow and translate at the language of science. Today's achievements of modern medicine, chemistry, psychology, can include the contemporary visual art as one of the sources for decoding the cure for many different diseases and much more than that. As a matter of fact, Quantum physics that defines the particle as the universal starting point for philosophical and mathematical analysis, is holding the “observer” as a vehicle of electromagnetic waves that is caring electrons of energy dispersed in logical order, as the light we see. As a matter of fact, the order of electrons is, also, scientifically proven and known today as the “wave interference.” That means that every single "thought" is made out of electromagnetic waves, which are rated through the observer's brain as a specific structure that has a specific vibration and radiation. Our brain is a mechanism to notice, decide and influence the surroundings in a way that we can discover, by ourselves. However, it also means that electrons that surrounds us can multiply thanks to the brain waves , which are nothing else but electro-magnetic waves created by our brain that are triggering a new wave interference every time we observe something . It is Logical that the reach of the "waves" presented through the "interference pattern", is increasing through time. This means that thoughts can spread within and over the bounders of our life, and have a crucial influence everywhere by their radiation. Having beautiful and peaceful thoughts means deserving and getting the best in life. The knowledge can help to achieve that state of mind. So, Art could be understood as the knowledge stored for new science turnaround towards the new energy, which exist within us, and it could be, also, triggered by some visual adds if they would carry the powerful "aesthetic code". Today it is known that the human brain is using less than 10 % of its capacity and nothing more than that has been scientifically proven yet. However, by exploring art, we could move our understanding of the way we are living today because Art was always opening new doors of our psyche that we never even knew, existed. Since 2004 she lives in Chicago, where she is working in art studio as a fine artist and as a graphic and web designer, too. She adjusted her talent to many different materials. 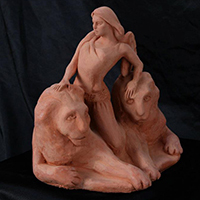 Marija is sculpturing pieces in terracotta, She is using also 3D design programs for sculpturing, she is painting oil on canvas, pastels and water colors. She is illustrator and a Photographer, as well. 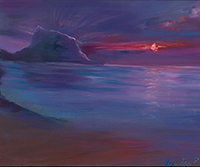 Marija received many important awards and recognitions for her art, which makes her an internationally recognized artist. 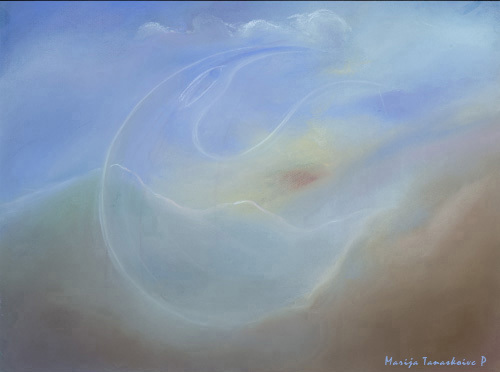 Tanaskovic obtained the highest recognition and many very important awards for her art from the world of renewed critics and curators in Italy, Canada and United States, Latino America, South Korea, and Serbia. One of them is Oscar Academy Awards for the Best Artist of the Year 2016 by foundation Costanza. The international critics placed her among the Best Contemporary Artists of the 21 century in many important books and publications. 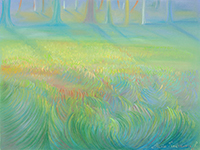 Some of her works are already in the museums: She exhibited art in different media in 2009 at Las Vegas Southern Nevada Museum of Contemporary Art where her pastel "Bridge" was kept permanently. The South Korean exhibition, in The Haegeumgang Theme Museum for Environment, Human, Nature, Coexistence, where one of her works "The Eye of The Sky" will be kept permanently, as well when she was recognized as an certified expert member of the Art Committee of International Culture and Arts federation in the field of painting by Chairman Yu Cheon. Europe Art Museum iin Denmark will keep her Photography Portrait in the Mirror after the exhibition. Artist are selected and Approved, each one is presented their country as a Leading Contemprary Artist of the beginning of 21 century. Curated by Leif Nielson . Photography "Portrait in the Mirror" was exhibited on MENSA photo cup 2005 n Belgrade and received high grades by domestic and international critics including Emir Kusturca famous film director. 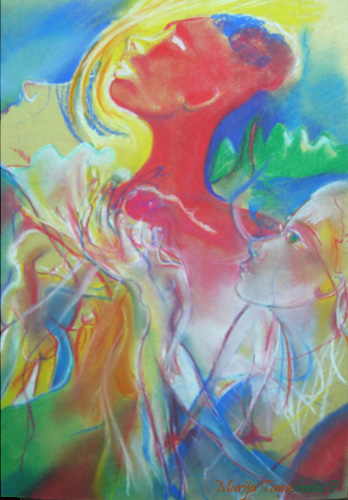 Later this work was exhibited at New York Art Expo, and was a front cover of Effeto Arte Magazine for September 2014. Art Addiction Community Gave the award of excellence media 3 art biennial in 2016 currated by Peter Russu. Also, she was exhibiting in group and solo exhibitions in Belgrade, New York, Miami, Chicago, Palermo, Venice, Florence, Milano, Rome. She had important group exhibition In Serbia/Belgrade - MENSA photo Cup 2004, curated By film director Emir Kustirica, Serbian writer and photographer and illustrator Uros Petrovic, and many others important individuals in Countries cultural life. Miami - Red Dot Art Fair 2013. 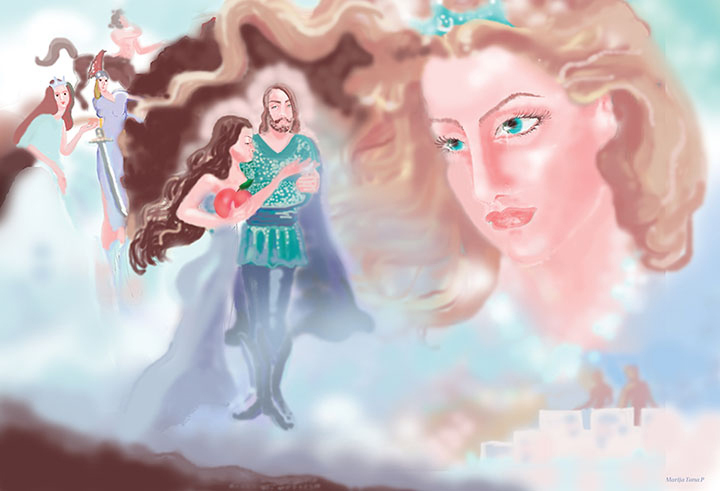 This artist was noticed by some of the most eminent critics and artists in the world that were giving her the highest grades for the quality of her artwork. This is what made a huge influence on her carrier. In the meantime her art was published in many prestige magazines and books. International Contemporary Masters Book #3 2011 that presented the Art of Museum Quality, and another book "Important artists of the world", that published her artwork pastel "Bridge" at the cover page in 2012. ATIM Top 60 Contemporary masters 2013, Art Tour International magazine and their blog posts 2103 and interviews recorded and showed on YouTube and on their ATIM TV channel. The catalog was gathering artist approve by critics of USA, Canada , Italy and Latino America. These Art catalogs were curated by Viviana Puelo. Vitorio Sgarbi selection of the artists for the book "Artisti" and wrote critics about them. She was very proud when she heard she was included. Article about "The best Contemporary and Modern artists in 2014", which included critics about her artwork, and the most recent book that mentioned and analyzed the best artists from the last and at the beginning of 21 century. “ THE BEST MODERN AND CONTEMPORARY MASTERS 2014”by Salvatore Russo and Francesco Saverio Russo that compares works of today’s masters as the continuation of masters from previous century like Picasso, Mondrian, Rothko...etc .., also, included her work into the group of deserving artists. Also THE BEST MODERN AND CONTEMPORARY MASTERS 2015 with the presentation in Dundas Gallery in Edinburg will be even more complete lexicon of The Best Contemporary Masters of today. 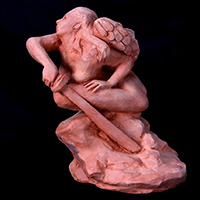 Among award on of the most important was the APOLLO Award as High Recognition from the world of Art, Science and Culture for showing with her choices, interpretive strategies applied to the contemporary art; she received for painting, sculpturing and photography and, also, Francesco di Assisi Award for human rights in 2014. The reception and public recognition took place in December 2013 at the Italian Ancient Theatre " G. Paisiello "of Lecce,where she was recognized as one of the world’s most important individuals in Art and Culture today. This artist also received many recognitions from critics in Italy, Canada and the USA. In March 2015 very important award she received is “Boticelli award” for art merit and originality of expression. "Art Genius" a publication of Effeto Arte, where artists were selected by Dott. Salvatore Russo include my work "The Dream Of Shangri la". In October 2015 Marco Polo - Art Ambassador Award, is one of the most important awards for an artist because the most important people in the world art and culture is a selected group of individuals that receive the award. The presentation was in gorgeous Palace Marin in Venice. Curated by Salvatore Russo and Francesco Saverio Russo. In December 2015 NOTO award - Is the Award of city of Noto which exsit in Sicily and it is a UNESCO heritage. In the museum of NOTO between imporatn peole of politic and culture UNESCO representatives will be present to honnor the artist receivng the award. Exhibition will follow. Leonardo Da Vinci award as the crown of the of the beautiful and successful year will come in January 2016. Very important for an Artist. Critics says is maybe the most important one. The presentation will be held in the hart of Florence in. In the heart of the ancient Florence, near ‘’Piazza del Duomo’’ and ‘’Piazza della Signoria’’, Borghese Palace is one of the most significate example of Neo-Classic architecture of the state capital, Florence. Even if its fasade is majestic, this palace could seem hidden by the strict road. But once you come in, the beauty and the elegance are dazzling: the large honour salon brings to the Mirrors’ Room , that was the bedroom of Paolina Bonaparte.The prize is given to those artists who has been chosen by Dott Salvatore Russo and Dott. Francesco Saverio Russo. ACCADEMIA ITALIA IN ARTE NEL MONDO ASSOCIAZIONE CULTURALE is awarding Marija Tanaskovic Papadopoulos for her Artistic Merit by international award The David of Bernini in 2015" and the special prize for Human Rights in 2015 Tribute to "Anne Frank".